, where is the Euler–Mascheroni constant. Named for Maurice Fréchet who wrote a related paper in 1927, further work was done by Fisher and Tippett in 1928 and by Gumbel in 1958. In hydrology, the Fréchet distribution is applied to extreme events such as annually maximum one-day rainfalls and river discharges. 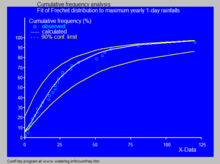 The blue picture illustrates an example of fitting the Fréchet distribution to ranked annually maximum one-day rainfalls in Oman showing also the 90% confidence belt based on the binomial distribution. The cumulative frequencies of the rainfall data are represented by plotting positions as part of the cumulative frequency analysis. 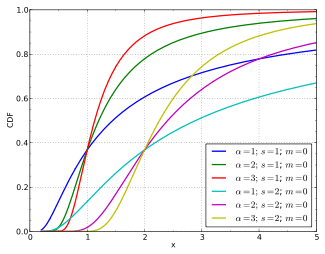 However, in most hydrological applications, the distribution fitting is via the generalized extreme value distribution as this avoids imposing the assumption that the distribution does not have a lower bound (as required by the Frechet distribution). One useful test to assess whether a multivariate distribution is asymptotically dependent or independent consists transforming the data into standard Frechet margins using transformation and then mapping from the cartesian to pseudo-polar coordinates . corresponds to the extreme data for which at least only one component is large while approximately 1 or 0 corresponds to only one component being extreme. ↑ Khan M.S. ; Pasha G.R. ; Pasha A.H. (February 2008). 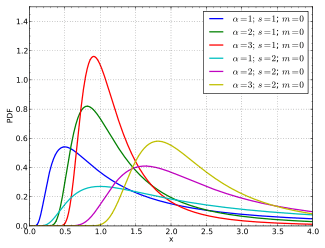 "Theoretical Analysis of Inverse Weibull Distribution" (PDF). WSEAS TRANSACTIONS on MATHEMATICS. 7 (2). pp. 30–38. ↑ Coles, Stuart (2001). An Introduction to Statistical Modeling of Extreme Values,. Springer-Verlag. ISBN 1-85233-459-2. Fisher, R.A., Tippett, L.H.C., (1928). "Limiting forms of the frequency distribution of the largest and smallest member of a sample." Proc. Cambridge Philosophical Society 24:180–190.